Christy Carver is one of the fabulous new additions to our Bella Bridesmaid family. Reopening the Raleigh location this past September, Christy has had a whirlwind of excitement… attending the NYC Bridal market in October, getting to meet designers and other Bella owners, and of course starting her own journey as a new Bella gal. We were excited to ask Christy more about her history, and how things are going so far this busy year! C: I worked in Corporate America for companies such as Grainger Industrial Supply and John Deere after graduating college. I had various administrative and marketing positions. Then I decided my skills and abilities could be better utilized, I could attain more specialized business experience, and get to know the fully functioning aspects of a business if I worked for a small business. Therefore, I worked for a smaller commercial appraisal company in Charlotte, NC and most recently assisted an Orthopedic Surgeon in opening and running his practice in Cary, NC. In college I always dreamed of owning my own business. After working in the small business environment it truly made me realize it was definitely where I was most happy and where I could best utilize my skills and abilities. 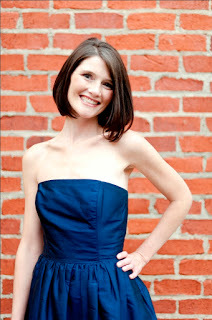 My close friend Heather Batt, owner of Hayden Olivia Bridal, came to me with the idea of owning a Bella Bridesmaid. Heather and her husband both thought it would be something I would enjoy and could truly excel in. After several conversations with them, and other Bella Bridesmaid owners I truly felt like it was the right career path for me. I loved the idea of creating an experience for the brides and their bridal parties. I thought that by concentrating on the niche of the bridesmaid dresses I would really be able to zero in on the brides vision; to deliver a dress to the bridesmaids that is something that is classy, chic, modern and can wear again. C: I have only been open a little over 7 months, but there are already so many. There was a specific bride that came in with her bridesmaid. They loved the AMSALE dresses. She really wanted the bridesmaids to all wear different jewel tone colors, but possibly wear the same dress. They had tried on a few but none really jumped out. I recommended a dress that was initially looked over on the rack. One of the bridesmaids came out in it…and it was stunning-that was dress! They went next door to eat lunch and afterward the bride came over and gave me a hug and told me what a great experience she had. As she walked out, I felt completely overwhelmed with happiness. Moments like that make it all worth it and shows me that giving the brides an experience they deserve pays off on so many levels. C: Wow a night on the town…I am a single mom of a 2.5 year old so I am not really sure what that would look like! 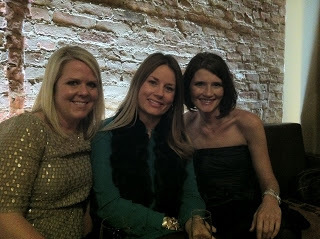 If I could dream…it would be a night out with my close girlfriends at one of my favorite local restaurants. I LOVE finding little neighborhood bars and restaurants, they always have such charm and normally fantastic food. The night would probably start and end with wine! I already have several of the Bella Bridesmaid dresses in my closet; however the one that I have recently had the most fun with and gotten the most compliments is LulaKate’s Christy with a straight skirt in Sand. Maybe it has something to do with the name! I have worn it with big chunky pearls, pearl stud earrings, and coral heels. It makes me feel fun and flirty with a touch of class. C: I can’t decide there are two: Katie Holmes- Giorgio Armani. It was elegant, classy, and I loved that it was off the shoulder. I also keep going to back to the dress Carolyn Bessette wore when she married JFK Jr. It was so simple, but breathtaking. Maybe it had more to do with having JFK Jr. on her arm! C: I have been told I have the “girl next door” look. I prefer simple, classy, comfortable…and elegant for special occasions. I normally wear stud earrings and a bracelet, but my jewelry is usually understated as well. I have been known to go all out and wear a chunky necklace! I usually add color with my shoes. I am known to wear all black then wear coral, red, or green heels. 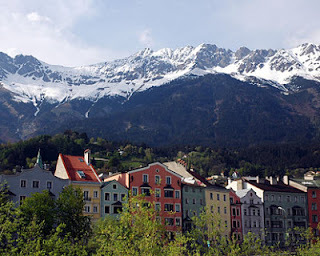 C: Absolutely hands down Innsbruck, Austria. I studied at the University of Innsbruck when I was in college. My room was just below the mountains; so every morning when I would open my windows I would have this incredible breathtaking view. The town was had so much history, culture, and character. My favorite was sitting in the park on Sundays, drinking coffee, and watching the older gentleman play life size chess. It just warmed my heart that life can be that simple. C: I am notorious for doing this…it drives my dad crazy! I right now I am obsessed with watching "The Proposal". I think I know it line for line. C: My two Tiffany Charm bracelets, JCrew Navy Cardigan (I take it everywhere), and my stud pearl earrings. C: Ryan Reynolds...and of course George Clooney! Diego or Handy Mandy?? Haha neither!